Most video games, it's safe to say, revolve around fighting: whether you're a soldier shooting up terrorists or a plumber stomping on Koopa Troopas, there's almost always going to be combat of some sort. And then there's The Novelist, a game created not to satisfy primal bloodlust, but to tell a story about a single family's struggles. 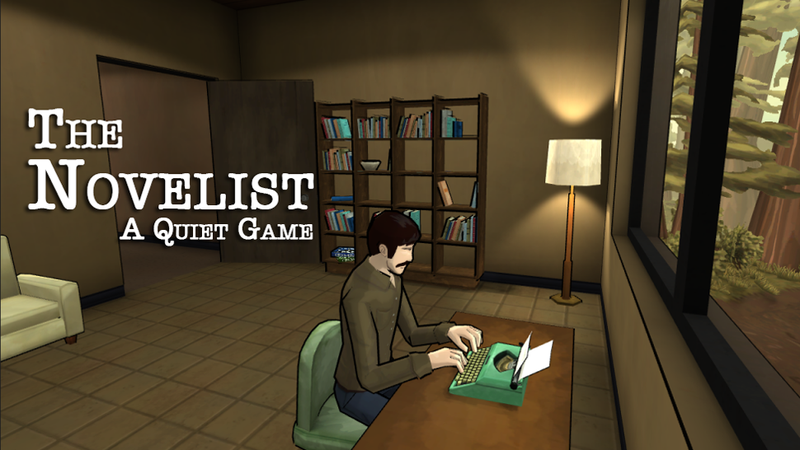 In The Novelist—which will be out for PC by the end of the summer—the player is tasked with guiding an author named Dan Kaplan and deciding how he will spend his days. There are no bullets or rocket launchers here: the core conflict revolves around Dan's ability—or inability—to balance his career, his marriage, and his relationship with his son. You, the player, don't directly control Dan; instead you are a ghost who inhabits his house. You can watch, observe, and manipulate at your discretion. One day, you might direct Dan to sit and work on his novel, boosting his career at the cost of neglecting his wife and son. Another day you might have help out his wife at an art show, or take his kid to the beach. Every time you go down one branch, the other two could suffer. The idea, designer Kent Hudson says, is to make us all think about how we approach our own major life decisions. "There’s no winning or losing," Hudson told me during a lengthy phone chat a few weeks ago. "You play through and get a story that my hope—and this sounds so pretentious—but my hope is that as you’re presented with the same fundamental question in nine different ways over the course of the game, that you start to learn about your own values. And by the end... maybe your guy has written the greatest book ever but his wife left him and his kid is getting in trouble at school at the time. Well, I guess when push comes to shove you’ve decided that career’s more important than family. Or vice versa." Whoa. It's an intense, appealing premise—video game as psychological test—but it evokes caution: aren't games supposed to be, you know, fun? "I didn't know it was even possible to make a game without guns," I told Hudson. I was joking, but there's something of a serious question buried in there. How do you get satisfying interaction out of a game that seems so... mundane? Hudson's solution: stealth. As the player-ghost in The Novelist, one of your goals is to ensure that Dan and his family don't see you and get spooked. So you can possess light fixtures and sneak your way around the house as you watch them all go about their days, The Sims-style. But that's all secondary. The core gameplay loop of the game—which unfolds over the course of nine chapters—is making mundane choices like "should Dan work on his novel or go on a date with his wife?" So maybe, as smart game critics and pundits have been arguing for years now, "is this fun?" isn't even the right question. Maybe that doesn't even matter. "There's lots of games that I love where a lot of times you're not having quote-unquote 'fun,'" Hudson said, "but you're making better decisions or you're grappling with different issues." Consequently, Hudson decided to randomize the order of The Novelist's chapters. There are a bunch of events, and they'll all happen to each player, but the sequence will progress differently every time you play. This randomization's purpose is to ensure that the emotional peaks and valleys of each relationship aren't tied to any specific event, like they might be in a more traditional narrative-focused game. "In my game, this relationship stuff under the hood is more of a sort of a dynamic simulation of these relationships, and so your wife could leave you after the fourth chapter or she could leave you in the very last chapter of the game. That's only ever gonna react to you as the player making choices in a different sequence.... I don't know if she’s gonna leave you in chapter four, if you decide not to help out with the art show, or if she’s gonna leave you in chapter seven because you decided not to go to her grandma’s funeral with her or some weird thing like that. And further, the arc of how you got there is all up to the player." Your Dan Kaplan could be the writer who published a great book, had an okay relationship with his son, and did just enough to stave off divorce. Or maybe your Dan Kaplan is an amazing father and husband who just lost his book deal because he missed all his deadlines. It's a conflict we all have to deal with, in some way or another, and it's not something you often see in a video game. But this is still a video game, and so the player's ability is a factor: there are methods in which you can perform "better" as you play. "There are ways for you the player to kinda spin things out of control in either a positive or negative direction," Hudson said. "You can either sabotage the relationships if you want to and see what happens there, or if you play really well and don’t get spotted, there are ways you can sort of, I don’t wanna say, 'have your cake and eat it too,' but there are ways where you can gradually improve things through time. My goal is not for it to be nihilistic or for it to say there’s no way to have it all." So what is Hudson's goal? He says he wants to get us thinking. How much time should we spend with our families? Working on our careers? What's the right balance? "I've only got so many years to do this. I wanna feel like I’m doing something with my time—with my limited number of years." I asked Hudson to share a bit about his own personal experiences, and he recalled his first few years working in gaming, at companies like Ion Storm and Midway Austin. He said he spent about four of his first seven years working on games that were cancelled or shut down. Finally, in 2011, after some time on an unannounced (cancelled) game with designer Clint Hocking over at LucasArts, Hudson decided to call it quits and go indie. "I started to put it into a larger context of well, crap, I’ve only got X number of years to work in the industry and just friggin' be alive as a human being," Hudson said. "I've only got so many years to do this. I wanna feel like I’m doing something with my time—with my limited number of years. Even if my game bombs, I will take a lot of pride in the fact that I at least tried something. I took a risk, I quit my job, I tried to make something different. If it bombs or if it’s not as good as I want it to be, or doesn’t sell—all the bad outcomes that can come from it—I’ll still take that over never having tried."